Are you wondering how to get your business on Google and improve your google search results? Google My Business is the way to do this and I can show you why and how. Over recent years Facebook and Twitter have stolen the limelight in terms of marketing businesses online, which has left other social media platforms overlooked and underestimated, such as Google My Business. I’m going to show you the benefits of using Google My Business and how to use it successfully when marketing your business online. Make Google a Marketing Priority! One thing that SEO has taught us is that Google is your best friend and should be used wisely, yet its social media platforms are underused and undervalued. These social media platforms are the key to managing your online presence across Google and having that bit more interaction with your customers. We suggest that you branch out from the overused Twitter and Facebook and take advantage of what Google has to offer. So, what is Google My Business and why should you use it? Are you a bit of a GMB technophobe? Find the whole social media process frustrating and alien? Don’t worry as I’ll give you the lowdown on everything this FREE and EASY tool has to offer. Google My Business isn’t so hard, essentially, the concept is in the name. Google my business is all about finding your business online and all its details across Google, including search and maps. Google My Business allows you to show important details that are useful to your customer including the address, contact number, opening hours, products/services etc, before visiting the website. You can also include customer reviews and short blog posts to showcase your business. Google My Business is a way of enticing the customer to your website and beating off the competition which leads to more and more sales! To set up Google My Business visit www.google.co.uk/intl/en/business/ where you can add your location, images, business hours, categories, profile picture, plus much more! Once set up your GMB profile will look something similar to our very own profile above. Increase local brand visibility with Google My Business! The whole point in using Google My Business is to divert your customers to your website and encourage interaction between you and the customer. If your details are not updated regularly you lose touch with the customer and your sales! Keep your address, phone number, opening hours and web address relevant at all times. Photos, photos and more photos! Get it? I cannot stress the importance of having photos of your products and services on Google My Business. GMB stats show that those companies that use photos receive 42% more requests and 35% more clicks through to the website. Photos and regular posts keep customers engaged and draws new customers in. People like to visualise what they are buying and would be more inclined to visit the website and get in touch. With Google My Business you can add as many photos as you like so get snapping! Top tip: Create quality photos. Do not use your average Google image, I mean we love Google but your own personal, good quality images do the world of good for your GMB profile. Google My Business allows customers to leave reviews on your products and service. Although it may seem scary that customers have free will to write negative comments, remember, they also have free will to big your company up, and it is how you respond which is key. Make sure you always respond whether it is positive or negative (if too slanderous they can be reported). This personal interaction with customers goes a long way. Encourage customers to leave feedback and respond in a professional manner, thanking customers for their lovely comments that we are sure you will receive. Do your homework, use software such as KW Finder to find out what people are searching for. Google My Business allows you to write blog posts that appear when customers find you on Google. A way of finding your business on Google is by keeping these posts engaging, fun and relevant. An example of this is a post I wrote for one of our clients (see below). 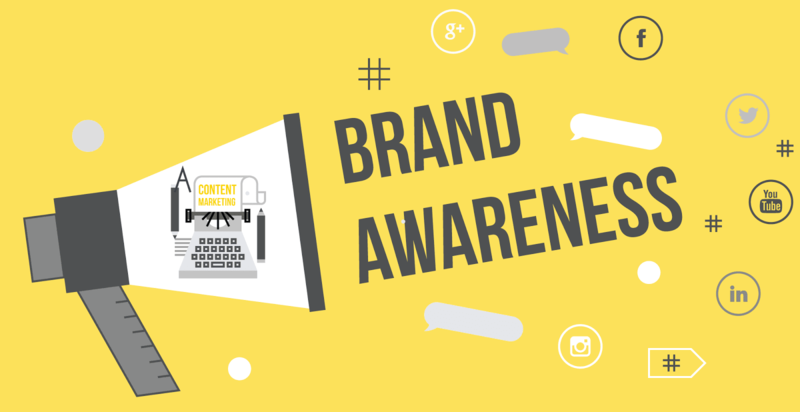 Ensure your post is optimised around keywords but ensure it is engaging and factual. The last thing you want is a spammy post as it’s not likely to keep Google happy is it! 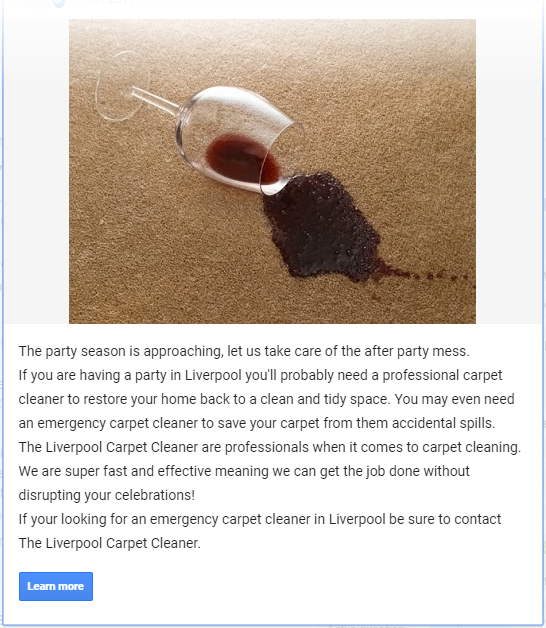 For instance, if you had a ‘cleaning company’ in ‘Liverpool’, target these words plus other keywords around these that are being searched regularly. You can have the most engaging Google My Business profile but if your website is not up to scratch you will not get the most out of this tool. GMB and your website go hand in hand so keep your website just as engaging and relevant. You are missing a trick if you are not using all of the tools Google has to offer. You want your business to rank high on Google right? Then the only way Google is going to reward you with high rankings is if your website / brand is appearing on the biggest brands on the web – and you don’t get much bigger than Google. There are so many benefits of Google My Business. It is free, it is easy, Google My Business is the way forward to market your business online and to improve your Google ranking. I hope I have revived Google My Business from the dead as it is well worth it. So get setting up your account today and your business will reap the benefits if you follow our guide to a successful GMB profile! If you need any help reach out to me via Twitter @foundd_laura or call me on 0151 329 2988. Hi my name is Pete, I run peteduffy.co.uk and am passionate about on-line marketing. Major Facebook News Feed Changes: What Do They Mean For Your Business?